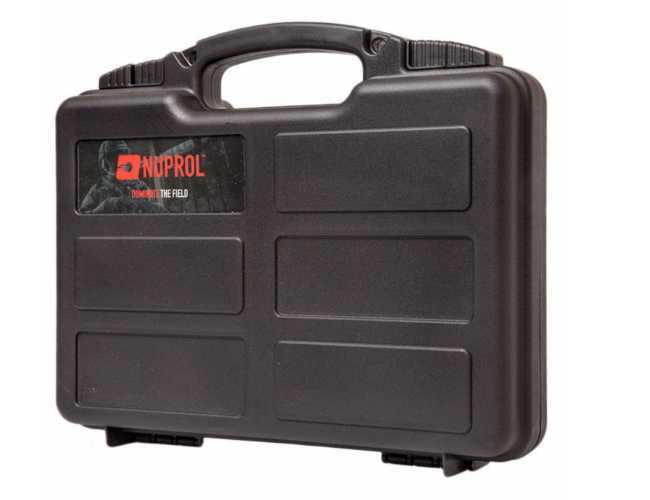 This pistol hard case is made from Polymer, and has Egg Shell Foam in the inside. It has a Carry Handle, with two holes that allows you to lock the case to be locked using padlocks. This stops anyone from opening the case without permission and it s a good safety feature. The case has 2 Sliding Latches that slide to lock the case and for easy and quick opening. The Case has a raised alternating pattern, this allows the case to be stacked without slipping.This is a great case for the Air softer needing a good case for their pistols and it keeps everything neat and safe. Holes for securing the Case. Lightweight but sturdy 850 grams. Size outside: 310 x 249 x 80 mm. Size inside: 304 x 192 x 71 mm.